We have just installed a new Silvelox showroom garage door. The Silvelox Overlap ARA is in our Garstang garage door showroom. The Overlap is the worlds first trackless sectional garage door, it is our highest specification garage door and is manufactured in Italy to the highest standards. The door leaf is made up of two 75mm thick laminated Multi-ecowood panels which results in a very secure and highly insulating garage door. There is a choice of 12 standard designs as well as the option to have your own specified design. Silvelox can also supply facias and cladding to match in with the Overlap garage door. 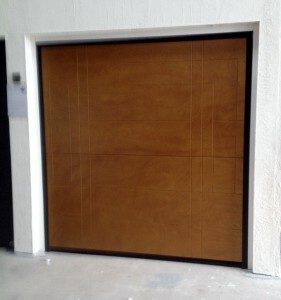 The door in our showroom is the ARA design okoume hardwood garage door. There is the option to have either a metal or wood facing on the door. 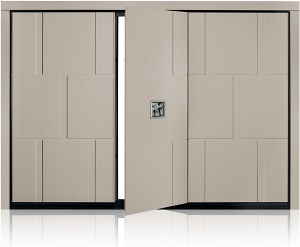 The metal faced doors are available with either a paint finish or a foil laminate finish. The wood faced doors are available in 5 different timbers with either a paint or stained finish. Silvelox Overlap doors are highly insulating. They seal all around giving a thermal transmittance of U = 1.00W/m2K. This is around 1/3 better than a traditional sectional garage door. Overlap comes with the Silhook physical locking system. This will still work even in the event of a power failure. Together with the 75mm thick solid wood panel, this makes the garage door extremely secure. Automation is a standard feature on Overlap doors. The operator is integrated into the head rail of the frame. Therefore, it doesn’t require any additional headroom. There is an manual release on the inside of the door in case of power failure. I the case of garages where there is no personnel access, a handle will be fitted to the door which can operate the manual release from the outside. Sizes go up in 50mm increments in both width and height, as the sizes changes the design does too in order to keep the door looking aesthetically correct. Come and see our amazing Silvelox showroom garage door. Also, we have on display alongside the Silvelox garage door a matching Silvelox front door. We are open Monday – Friday 8am-5pm.